Everyone needs a little help with their devices sometimes, which is why Samsung is continually investing in Samsung+, its app dedicated to helping those who use its mobile products. Today, Samsung is rolling out version three of its helper app, though this particular update feels more like its official launch party. Samsung+ has been completely revamped and comes with a bevy of new features, including better live customer support and a new community feature that’s there to inspire you to reach out to other Samsung faithful in your time of need. 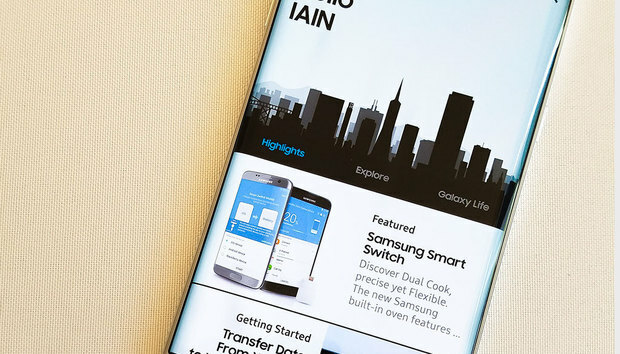 Samsung+’s latest makeover displays everything you need to know on the Home page. Samsung+ is now more modern looking with its black and white aesthetic and menus that are easier to navigate. Services like live customer support and device diagnostics can be accessed immediately from a floating action button, which rests on top of a feed of articles relating to any of the devices you own. Need help figuring out how to use your Samsung device in the real world? That’s what the explore section is for. Samsung is attempting to foster a community of sorts within its Samsung+ app. Samsung is also attempting to foster a community within Samsung+ between device owners. You can search for help topics or post your own if you the answer you seek is unavailable from the official source. You can call for help from the floating action button. Perhaps the most interesting new feature of Samsung+ is the improved live customer support, called Samsung Assist. I’ve tried this before and it’s akin to Amazon’s MayDay. Customer service representatives can now take over your device via a code-based exchange that terminates after you’ve hung up the call, and it works whether you’re video chatting or calling over the phone. As you ask questions, the agent on the other end will take control of your phone and use a virtual highlighter on your screen to show you what you need to know. In the example Samsung showed me, the representative taught us how to troubleshoot our Bluetooth connections by navigating to the Notifications panel, circling the Bluetooth icon, and then navigating to its options in the Settings menu. It was reminiscent of using remote desktop with your IT department, and over Wi-Fi there was little delay. The story behind the story: I’ve written about Samsung+ before. Samsung is attempting to make the service into more than just a helper application. The idea is that its existence helps inspire brand loyalty among its customers, and frankly, it’s one of the better marketing pushes on Samsung’s end. My favorite use case for Samsung+ is with my mother, who is constantly asking me for help with her Galaxy S6 Edge. The last version of Samsung+ had helped in some situations, but eventually things got so bad with her device that I had her switch to a Nexus 6P while Verizon swapped out her unit. I don’t think Samsung+ will offer that kind of support—the kind that helps you avoid dealing with your carrier. But I do think the idea of creating an easily accessible community for its loyal users will prove wholly beneficial for Samsung in the end, especially as it finds itself up against competitors like Google’s Nexus devices, which now offers services like Nexus Protect, and Apple, which is nearly the shining example of customer support with Apple Care and its numerous Genius Bars. For Samsung devices going forward, Samsung+ will come preloaded on your device. If you don’t already have it and you’re interested in trying it out, you can download it directly from the Google Play Store.